What an adventure this World Champs has been! Crazy track, weather and Canucks! I didn’t start feeling good on the track until Saturday, I think with jet lag and just in my head a bit. I played my cards right this week though, being patient, getting on the flat pedals and practicing for the worst weather possible. The rain came hard on Saturday afternoon and through Sunday as it was supposed to. I had a pretty big crash in practice the morning of the finals, think my pinky finger is broken or dislocated, need x-rays when I get home, we’re just pretty bruised up in general from the entire week. The track got worse as the day went on. I knew that all the juniors were crashing in their finals, the conditions were horrendous. The track was the gnarliest I’ve ever seen it, just getting eroded and lots of slippery shale slabs coming through. It seemed to be ridden in more this year too and hard-packed in sections so it was harder to break through and form ruts to help guide you down. Like ice! I decided that if I just toned it down a little, rode smart and stayed on I could get a good result. I didn’t expect 3rd! But trying to stay on was not an easy feat, was soooo scary and I literally was, at moments, just hanging on like superwoman. Hit most of my lines and big jumps but I started sliding a bit before the very last 2 gravel jumps into the finish and didn’t go for them, bit bummed about that as they were fun to finish off with, just didn’t want to risk anything so close to the finish, I had almost made it down! Plus my goggles were caked and couldn’t see much. And riding calculated, as i do mostly, paid off! Congrats to Emmeline Ragot who absolutely slayed that track in Emmeline fashion and managed to stay on in the process. 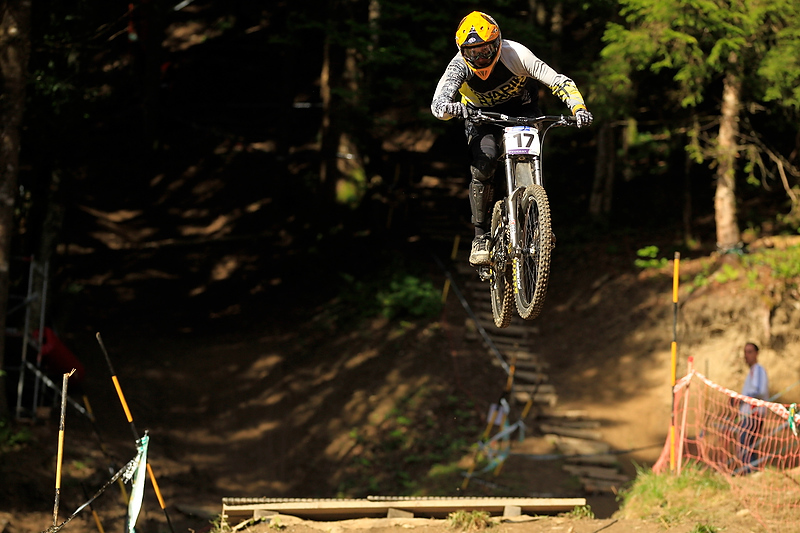 And to Rachel Atherton who managed a 2nd place despite a few crashes! Just goes to show how gnarly it was out there with all the rest of the top girls crashing out of medal contention. I guess at Worlds it’s all or nothing for most. But for me, not being at the World Cups this year, I just wanted a solid result. Got it! Woooo! 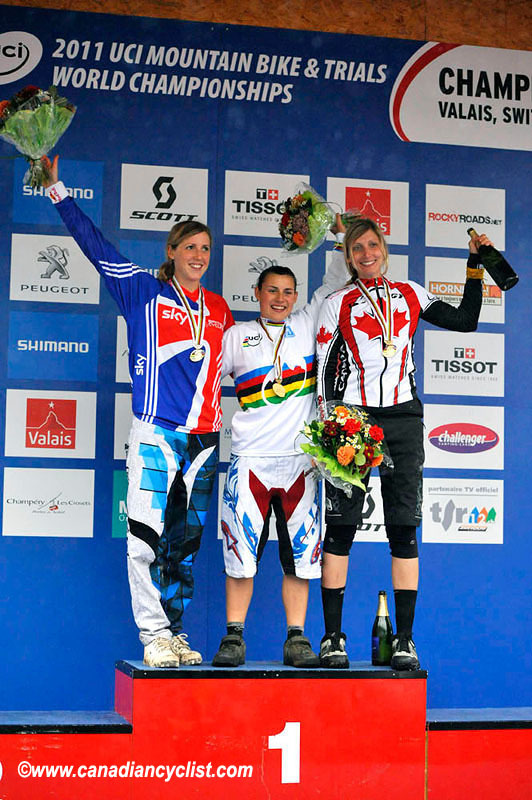 Congrats to Canada’s Catherine Pendrel, World Champ XC! And Canada’s Lauren Rosser for the bronze in Junior Women DH. Huge YEAH to Danny Hart who looked like he was just having an awesome time on his bike the whole way down. Props to all who rode, slid, tumbled their way down that track. It was ridiculous out there. Thanks to the CCA staff for taking care of us: Dan, Geoff, Nick, Guy, Kelly, the mechanics. Was a great vibe on the team, stoked to bring a medal home for Canada and all of my supporters/sponsors! Thank you!